In this business the depth of experience is as important as the depth of your product line... STAR SU offers a wide variety of gear cutting and tool grinding machine tools. Star CNC Grinders provide industry-leading solutions for the reconditioning and manufacturing of end mills, high performance drills, step drills, form tools, orthopedic surgical instruments, and large diameter carbide tools. In our comprehensive cutting tool line you will find almost everything for your cutting needs, including patented solutions you will find only at Star SU. Our expert staff will work closely with you to make sure you are able to meet your requirements. Whether you need emergency machine repairs or a scheduled maintenance plan, software troubleshooting, or operator training, Star SU service engineers can assist you. With our extensive line of products and services, we can customize every aspect of your gear cutting operation, from cutting speeds and feeds to automation and tool coatings. More than 80 years in the cutting tool industry gives Star SU and Star Cutter the expertise to manufacture superior tool cutting, grinding and hob sharpening machines. Our comprehensive cutting tool line includes hobs, drills, reamers, and almost everything for your cutting tool needs, including patented solutions you will find only at Star SU. Parts & service, machine maintenance, repair, spare parts and training from one source. 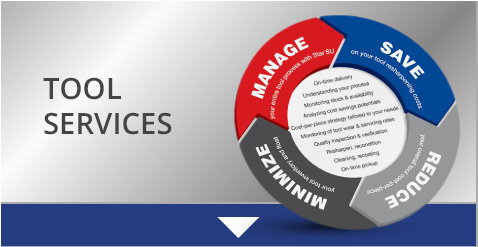 Whether it's emergency, custom, or routine, Star SU provides complete tool management. Field tested manufacturing solutions for extending tool life, improving part quality, reducing cycle time, improving surface finish, and more.